Coremata, including Hair Pencils, is a phenomenon associated with Lepidoptera. They are signalling structures produced by males that are seeking females. They have been proven to transmit pheromones that act as aphrodisiacs and even tranquillisers to females. Further they may act as repellents to rival males. I have documented this situation before in this blog. 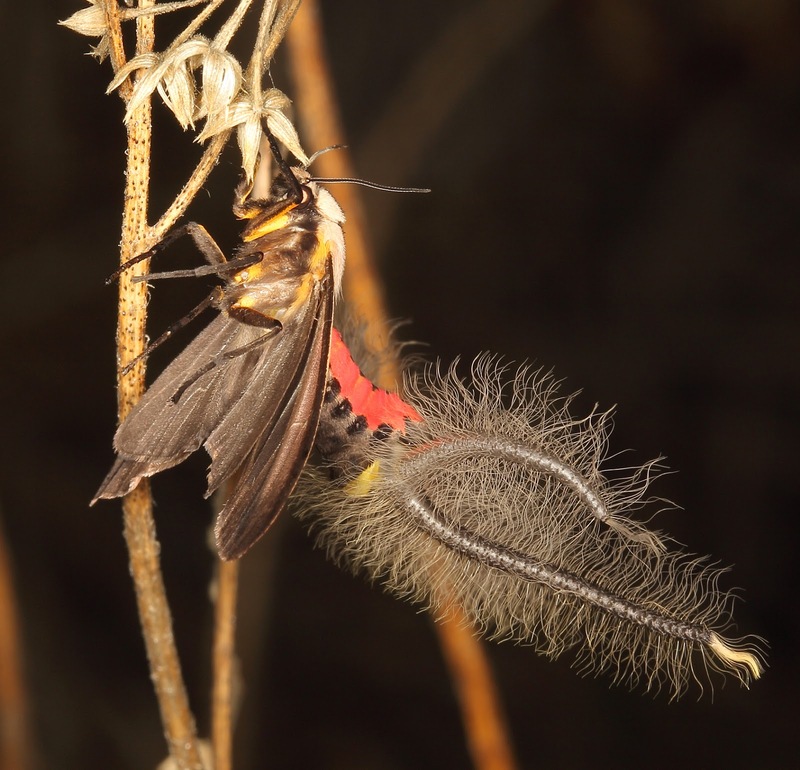 The hairs protruding from the abdomen of Syntorarcha iriastis Meyrick, the sound-producing moth, are the Hair Pencils. Moth of the family Arctiidae seem to be the champions when it comes to the ultimate in bizarre development of Coremata and Hair Pencils. I have seen the phenomena only twice, once on a fieldtrip in the 60's with the late Don MacNeill in California and the other just a few days ago in th Daintree region of far north Queensland. 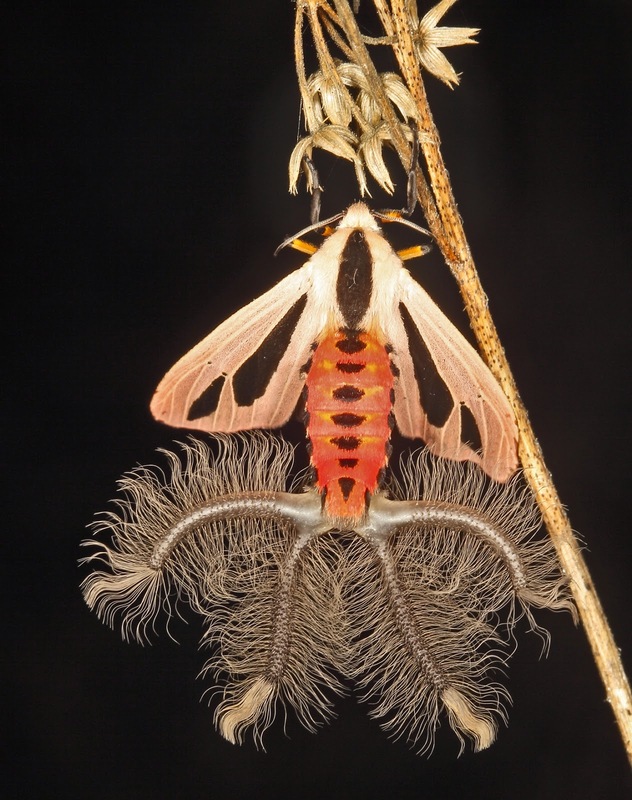 Here we see a relatively common tropical moth, Creatonotos gangis (Linnaeus). This male has the portion of his abdomen extruded displaying the Coremata and the Hair Pencils. The tubes, the Coremata, are inflated by blood pressure and the hairs transmit the pheromones. The moth was probably in the early stages of this "broadcast" since the last few hairs have not been separated. I have seen many individuals of this moth at night but have never seen it with this display. I was very fortunate to have had my camera handy and not to have stumbled or moved the twig where the male was perched. Even the slightest disturbance would cause him to retract the Coremata. Viewed from the side, structures are even more striking. This moth was described by Linnaeus in 1763. What would he have thought if he had seen it in this juxtaposition? Ever since the end of May on nights when it is warm and wet, the rainforest pulses with what seems to be a continual din of cricket song. The songster is a short-winged field cricket, Cephalogryllus species. This is a pretty large cricket, measuring about 25 mm in length. They seem to be quite common but localised to some extent with small aggregations here and there. They are subterranean. Males sing from the burrow entrances after dark on nights when the humidity and temperature is to their liking. It seems that they are silent when the temperature drops to 14C. The short wings serve only to produce the song. They are too short for flight. There are 14 described species all from the Australian tropics. This one is most likely C. tau Otte and Alexander, but the hind leg is quite different from that described for typical C. tau. So it may be undescrbed. 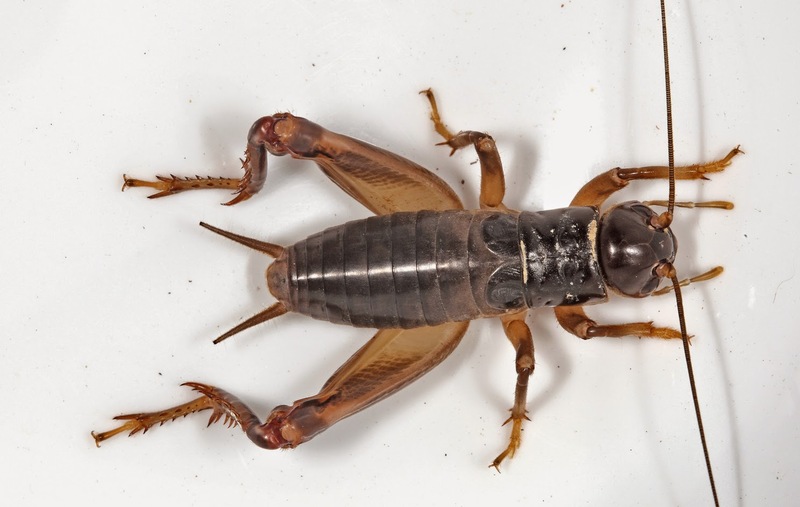 Although the loud sounds coming from these crickets reminds one of a continuous calling tree cricket (Oecanthinae), the individual calls are just long trills followed by a pause. But they are not co-ordinated so the result to the ear is a continuous trill. They are highly ventriloquial and individuals are very difficult to pinpoint. Once this is successful, it is often a bit embarrassing that the calling male was so close and yet apparently "invisible". 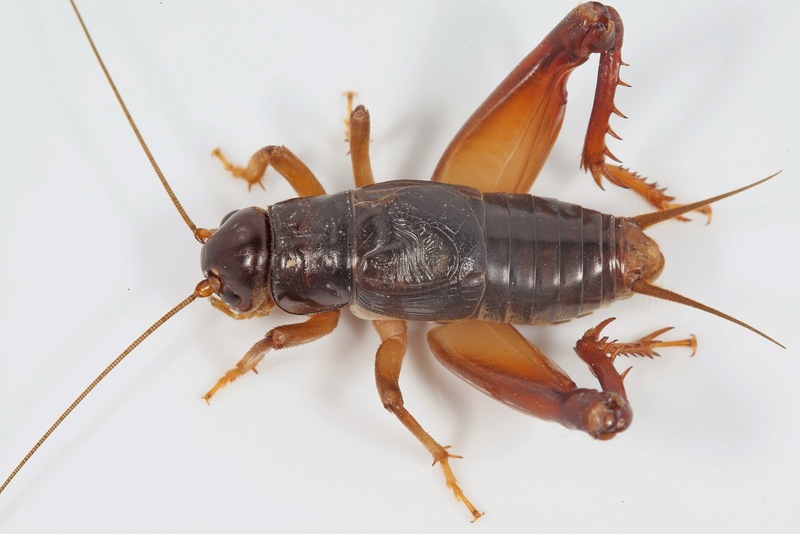 The crickets use their heads to move soil to the surface when they are excavating, hence the origin of the generic name. I have not properly dug the burrows to reveal their structure. This is a tedious task as the burrows meander through a labyrinth of roots and stones. The few that I have dug produce only males. Several had last instar male nymphs. This is a last instar male. Note the short, undeveloped first pair of wings, the tegmina. The biology of these neat insects is still poorly known. They re said to drag dead leaves into their burrows. I have never seen an individual abroad at night. Baiting with an oatmeal trail has resulted in only a few cockroaches and beetles but none of these crickets. One would assume that the reason for the males' calling is to attract females. This would seem to necessitate females moving about on the surface of the ground but as noted above, females have not been found. I have checked the oatmeal at several times during the night. 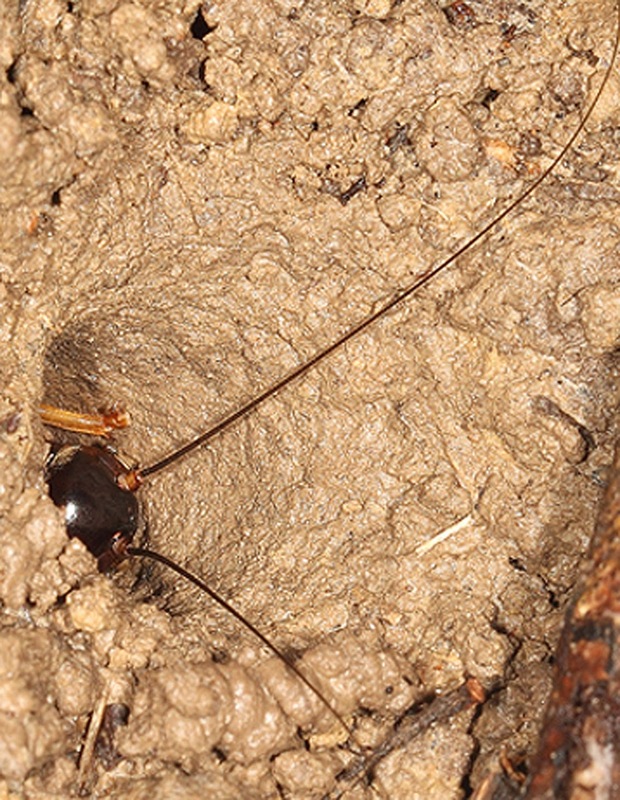 It was noted in Otte and Alexander's treatise on the crickets of Australia that the excavated soil around the entrance to the burrows was peppered with cricket droppings. These can be seen as the black spots above. This may not be happenstance. 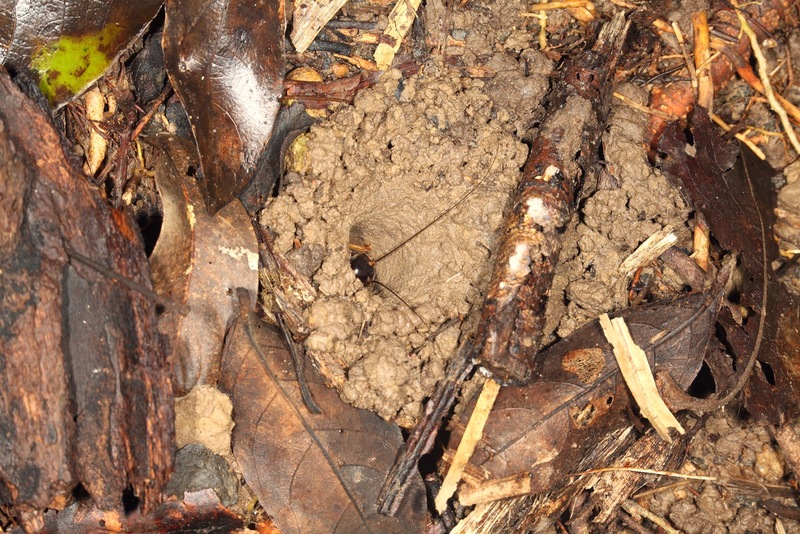 Could the droppings have some attractive properties that aid in the procurement of females? On the other hand, they may have some repellant function to ward off enemies. Of course, at this point, this is just conjecture and there may be nothing associated with the droppings. Otte, D. Alexander, R. D. 1983. The Australian Crickets (Orthoptera: Gryllidae). Academy of Natural Sciences of Philadelphia. Monograph 22Pp. 1-477.